Big data applications represent a fast-growing category of high-value applications that are increasingly employed by business and technical computing users. However, they have exposed an inconvenient dichotomy in the way resources are utilized in data centers. Conventional enterprise and web-based applications can be executed efficiently in virtualized server environments, where resource management and scheduling is generally confined to a single server. 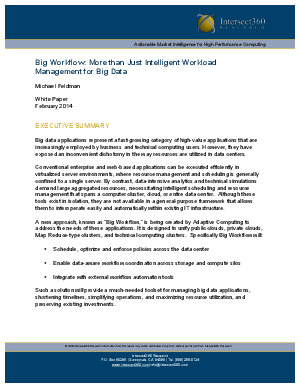 By contrast, data-intensive analytics and technical simulations demand large aggregated resources, necessitating intelligent scheduling and resource management that spans a computer cluster, cloud, or entire data center. Although these tools exist in isolation, they are not available in a general-purpose framework that allows them to inter operate easily and automatically within existing IT infrastructure. Such a solution will provide a much-needed toolset for managing big data applications, shortening timelines, simplifying operations, and maximizing resource utilization, and preserving existing investments.